"The choice is yours. Each door offers something different. Each has specific advantages. Tell us your situation so we can better advise you. The bottom line, its the customers choice. Only Schweiss Doors gives you that advantage. Schweiss Doors already has a long history in the door world. We are the first choice for thousands of customers and our Hydraulic Doors are creating great interest. With either door, you get Schweiss Quality. Talk with us first and we can make your decision easier... Hydraulic or Bifold!" " You decide which door works for you. " The One-Piece® hydraulic door acts as a large moving wall that swings outward when opening, requiring extra space as the door travels outward to the open position. To avoid possible damage to equipment, vehicles and airplanes, clearly label the doorway or ramp area “No Parking Area”. By clearly marking the “No Parking Area” there will be minimal loss of valuable parking space in front of your hangar/fly-in home/shop/warehouse/storage building. At airports with hangars located on each side of the taxiway, keep the door open or closed (not half open) to avoid damaging wings as planes taxi by the front of your hangar door. Schweiss recommends that all One-Piece® hydraulic doors have windows in the door frames. Windows will make any obstructions in front of the door visible to the operator before opening the door. from a moving door.WARNING: Schweiss does not recommend using the door as an extended work area or for parking your expensive equipment or airplane. Your door is the largest piece of moving equipment on your building and can be dangerous. Keep the doorway clear. Door swing outward when opening. The doors need extra room to travel when opening. Caution! No parking on the Ramp or Driveway! Bifold doors have a huge advantage when opening. They start by raising upward, not out ward. They requiring less operating space in the front of your building. The area in front of your large door opening is very valuable space. The two piece bifold allows more usable space in front of your door opening. Bifold doors are a real space saver. The fact that bifold doors fold in half instead of just swinging out, allows for more open ramp/ vehicle space in front of the hangar. 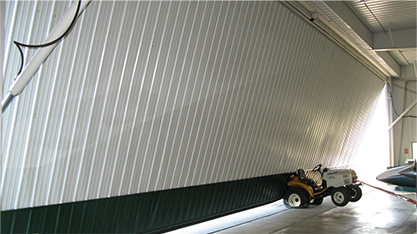 It also allows the full use of the width of the hangar, making the entire end wall a door. Both Bifold . . . And Hydraulic . . . Grease Zerks on all Hinges . . . Standard on every door! Where you hang the door matters! A hydraulic door is ideal in situations where maximum clear opening must be maintained. There is no loss of headroom. There is no headroom lost inside the building. Bifolds doors mount up and above the clear opening on the outside of the building structure. There is also no headroom lost inside the building. No need to make the building taller! lie flat 90° when in the full open position. 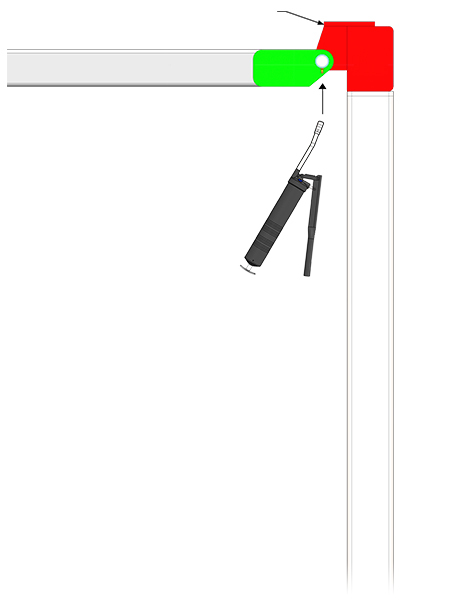 The One-Piece® hydraulic door will be at 90° from the building when fully open. External trusses are standard on hydraulic doors. Optional Internal Trusses are available. 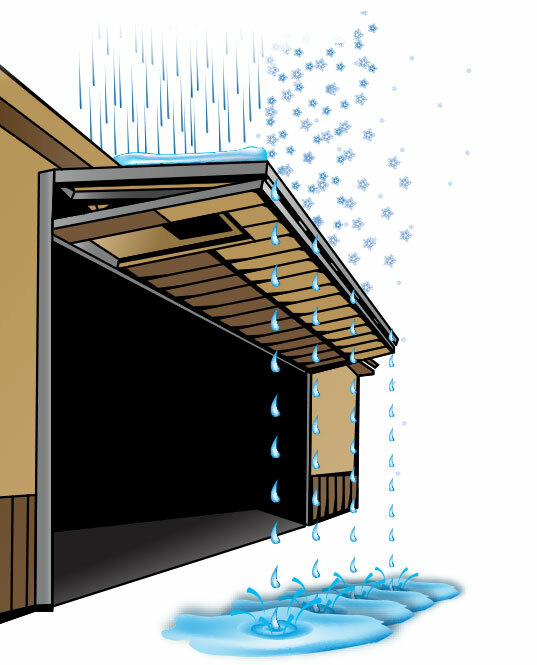 One-Piece® doors should have a slight downward slope when open to direct moisture and water off the door sheeting. This prevents moisture and water from seeping under the door sheeting and ruining the interior door insulation. to allow your vehicle/machinery in, then lower the door to create a slight slope for moisture to run off. 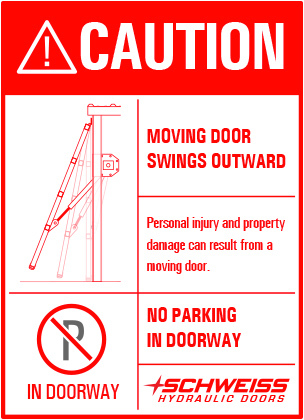 CAUTION: Remember to open the door again when moving your vehicle/machinery in or out of the building. OR ORDER THE DOOR WITH A BUILT IN SLOPE ! Request a taller door frame that allows you to open your door to the full clearance while still having a slight slope to the door in the full open position allowing proper drainage . 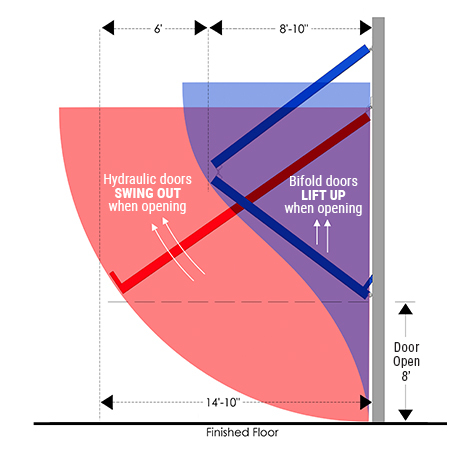 Bifold doors have a 1:12 natural slope when in the open position. The sheetin on bifold doors are flashed to allow water to easily drain off the door. Water and snow run off in any position! I like the shade when open ! Hydraulic Doors swing outwards when opening. Hydraulic doors require more/greater space in front of the doorway for the door to travel outward. 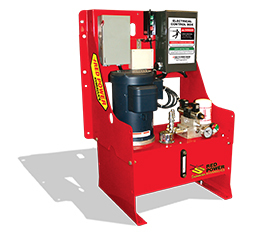 Soft shift valves located on the hydraulic pump allow Schweiss Hydraulic Doors to open and close smoothly preventing any jerky motion when operating your hydraulic door. Schweiss doors are built with safety in mind! Schweiss hydraulic doors have built in safety features. 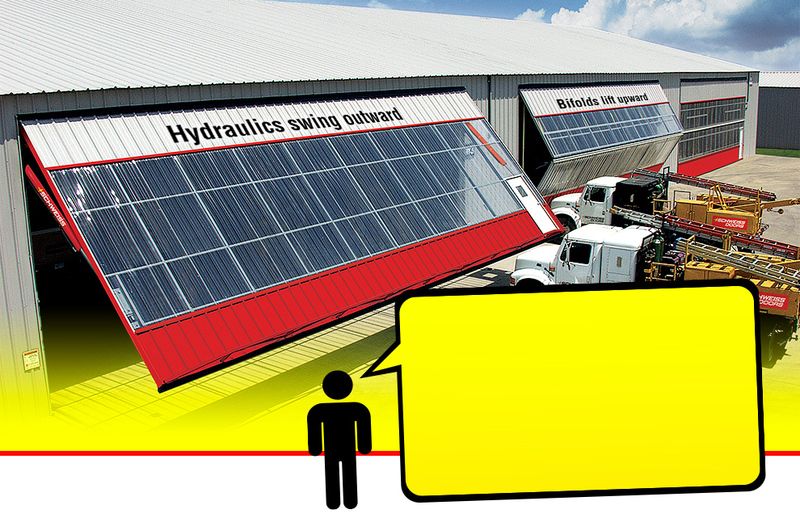 Large hydraulic overhead doors must STOP ! ! ! LEARN THE DIFFERENCE . . .
Restrictors / ORIFICE . . . They may be setting you up for slow motion disaster, Your worst nightmare! 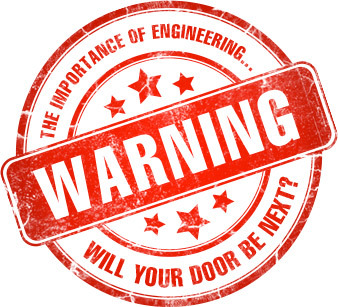 Does your door use restrictors/orifice? Hope not. Be careful if phrases like these are being used to describe the safety of a door. restrictors /orifice . . . Ask yourself . . . How safe can that be? Ask your neighbors what they have? The Fact is . . . The Door Will Not STOP ! Cylinders that have . . . Door will come all the way down if theres a failure, no matter what. Multiple Lift-Straps Rated for 29,000 lbs. Wider the door the more lift straps that are used. Motor - GearBox - Electric Brake. Hydraulic doors and subframes attach to the building structure and exert considerable horizontal and vertical loads to it. The building must be prepared to support the forces of your door in all positions.. The longer or further a door frame sticks out from the building at a 90°, the more torque and stresses it adds to the building structure and header. Hydraulic doors swing out when opening and cantilever out from your building, pulling away from the building structure at the hinge line and exerting additional forces on building header. Bifold doors fold in half when opening and create a slight slope to allow water to run off. Bifold door frames attach to the building structure, exerting forces and vertical loads to the building structure. The building must be prepared to support the forces of your bifold door in all positions. 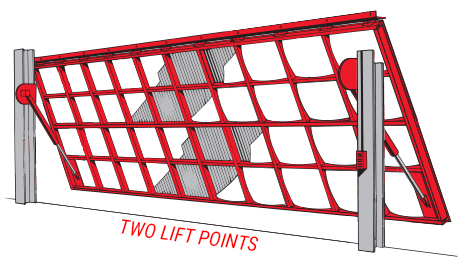 Hydraulic doors lay in a flat 90º position when fully open. Is it Safe To Leave The Door Open In Windy Conditions? All doors attach to the building and exert forces onto your building structure. Adding windy conditions to a door in the full open position will cause it to act like an airplane wing or a parachute, carrying the powerful wind forces back into the building structure. No matter what size door you have, all the weight and forces are transferred back to your building. 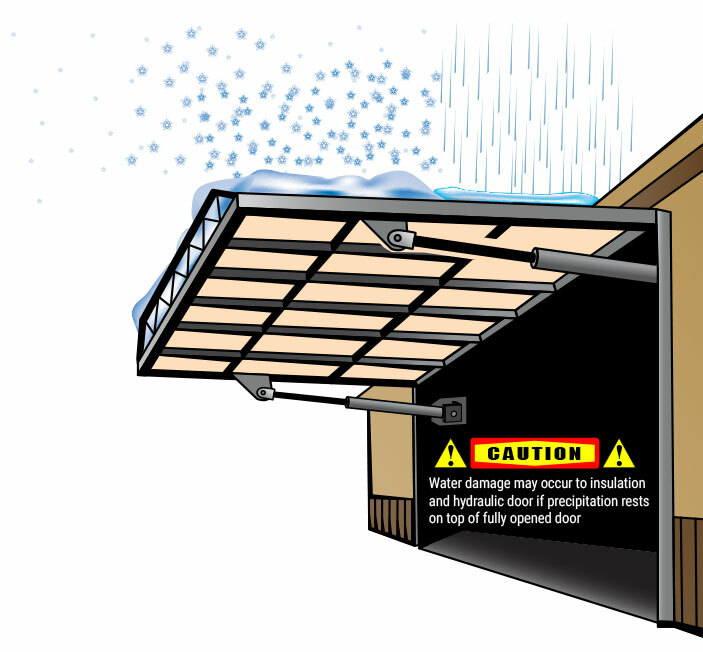 Hydraulic doors are more susceptible to wind problems when open than a bifold door. More surface area for the wind to catch. SCHWEISS doors will hold up . . . but will your building? Schweiss has recommended safe operating parameters. 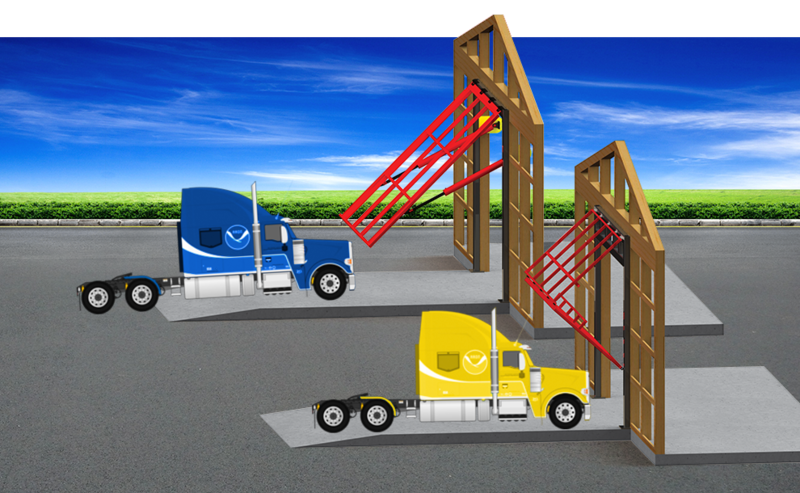 An external truss is located on the outside of the One-Piece® hydraulic door frame three inches off the floor/ground level. The external truss is pre-built to provide added strength and rigidity. Very important in high-wind conditions. 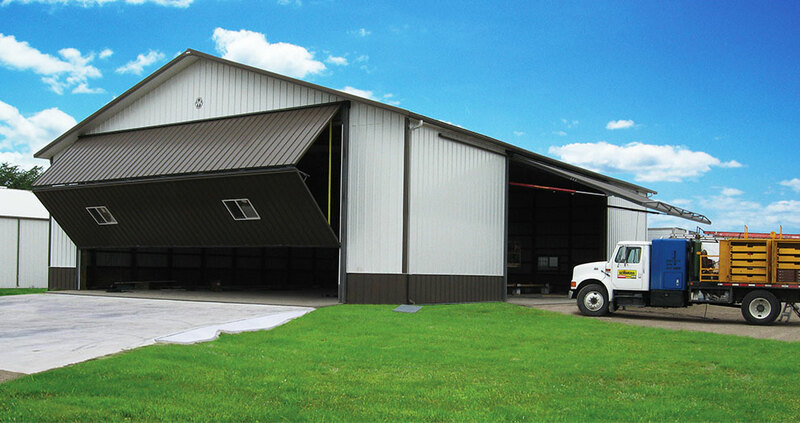 Hydraulic doors are manufactured with a support truss to provide strength and proper wind loading to the door. It also minimizes the door sagging in the open position. Custom enclosed & flash the external truss give it a neat appearance. Custom designed trusses to match the look of your building structure. Internal trusses are available on your hydraulic door, but you sacrifice headroom space! Advantages of an interior steel truss is it will not be exposed to the weather elements. No place for the leaves, debris or snow to collect or for the snowplow to hit! When you go with an internal truss you lose headroom unless you mount your door higher. "No Truss" on smaller size doors. The “No Truss” look gains valuable headroom and gives you a clean look both outside and inside the door frame. Bifold doors are manufactured with an internal truss for support to provide strength and proper wind loading on the door. Bifold doors come standard with an interior truss that mounts to the inside of the door frame. Nice clean look outside the door. Located on the inside of the door frame. Located out of the weather elements, protected. Internal truss allows you to match your door covering to the building structure's. It will appear as one continuous wall - with the look of your choice! Up and out of the way of people walking by or in the area. Snow plows won’t run into it. Won’t collect debris or snow. Provides extra strength to the door frame. Allows proper drainage of the door in the open position without a truss to get in the way. Located at the center of the door. Will not collect snow when the door is in the opened or closed position. When extra strength is needed, Schweiss also offers an external truss. 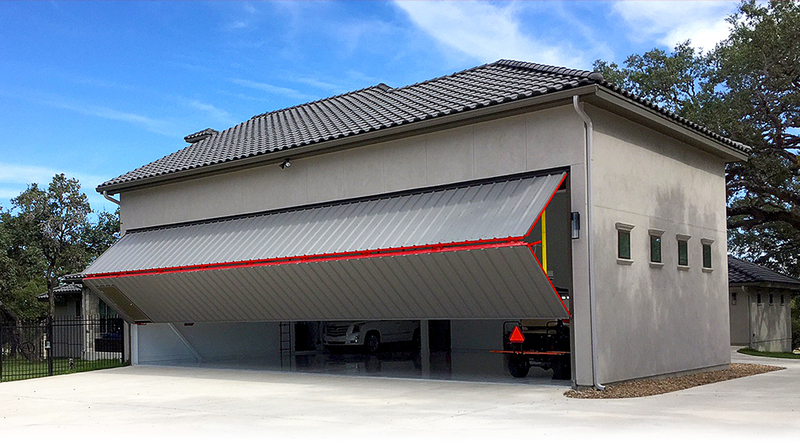 Hydraulic door comes pre-assembled, pre-welded and delivered pre-hung within their own subframe for easy installation, giving the buyer or builder tremendous flexibility as well as saving time and money! Double push tube door frame comes pre-assembled, pre-welded and pre-hung to its own subframe header Tube. Schweiss vertical door members are stronger and are spaced closer than other’s for more strength. Schweiss does not allow wood on any of it’s door frames. Safer! Provides added support for the door and the building structure. 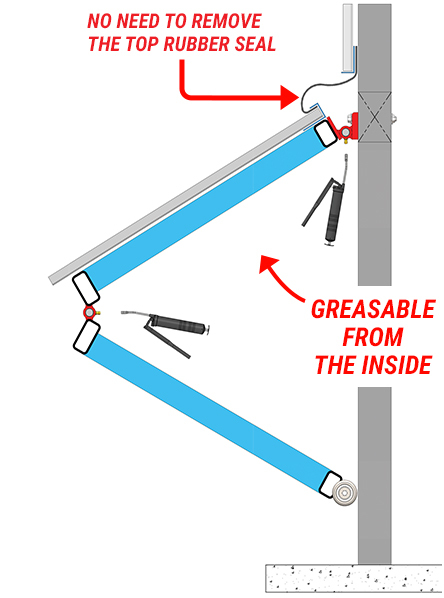 Heavy-duty greasable hinges are pre-located, pre-welded and pre-hung to the subframe header tube. Mounts to the building structure with heavy-duty mounting brackets and bolts for easy installation. Side column legs come with cylinder brackets that are pre-assembled, pre-welded and pre-hung at the factory to secure each hydraulic cylinder. Comes with pre-drilled mounting holes so through bolts can be easily attached to the building columns to help secure the door assembly to the building structure. Pre-locates the hinges for the doorframe. Pre-locates the upper hydraulic cylinder brackets. Others may lead you to believe that because of the doors subframe . . .
Building does not have to be made stronger. Building does not have to be modified to hold a door. Building does not have to be engineered with extra reinforcement to accept a door. Customer does not need to do anything to the building. Door does not hang on your building. Will you be attaching the doors subframe header to our building structure in any way or will it stand alone by it’s self? Will you be securing the vertical subframe side columns legs, that the cylinders are attached to, to the building structure or will they stand alone? With all the myths listed above, it sounds like no one is relying on the buildings structure for added support... I DOUBT IT! The horizontal subframe header tube is bolted / connected to the building’s structural header. The cylinders are attached to the verticle subframe columns and bolted / connected to the building’s side columns. 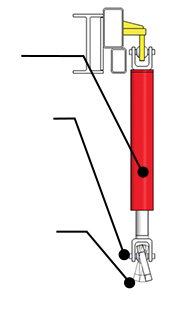 The cylinders are attached to the moving door frame while being fixed to the subframe side columns legs, which are directly bolted / connected to the building structure. The subframe and door rely on the building for support! 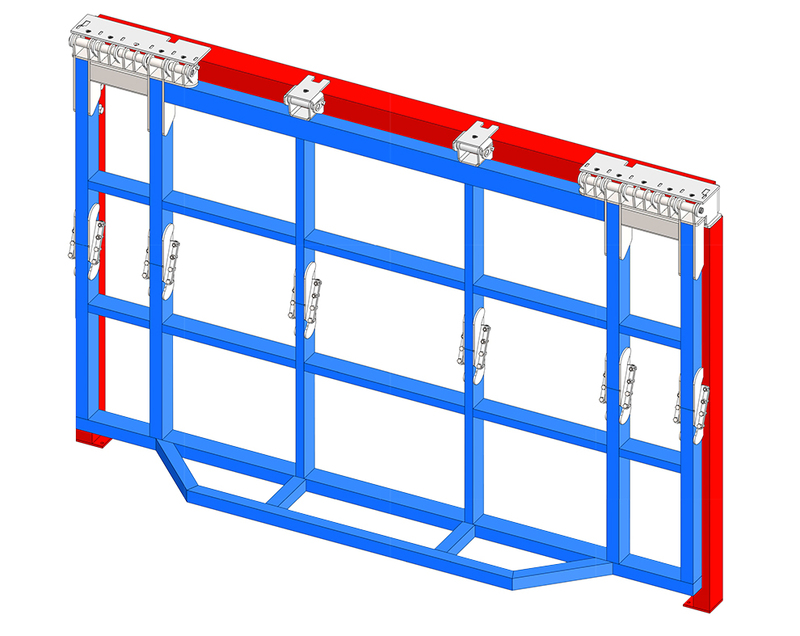 The subframe is an important part of delivering a pre-assembled hydraulic door with the pre-located cylinder brackets and hinges for ease of installation! Telling your customers . . . “There is no need to do anything to the building to accept a hydraulic door . . .” could be far from the truth or even unsafe! The building manufacturer/contractor/owner is responsible to ensure that the building's structural design is capable of handling all the imposed loads that the door exerts to your door header, end wall, and building. Your building header/column design must meet standard deflection and strength criteria, both in vertical and horizontal directions to support the Hydraulic door in all positions. 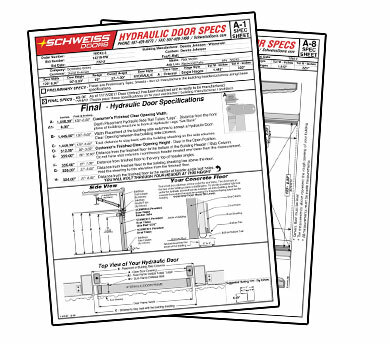 Schweiss provides easy-to-read, necessary specs sheets with each door showing all the forces and building header requirements. Schweiss offers both styles of doors The Choice is yours! Schweiss Manufactures both styles of doors. YOU can decide that is best for you! View Single Page Layout. . . "Door Comparisons"
View Two Page Layout. . . . ."Door Comparisons"